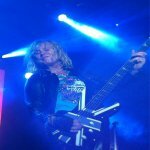 Def Leppard played the 11th show of the Summer Tour 2013 last night in Gilford, NH with another 17 songs performed. The band played with opening act Slash w/ Myles Kennedy and The Conspirators plus Vermont band Stone Bullet playing on a side stage. This was the first visit to the city by the band who'd previously played in Manchester, NH four times since 2003. Also the first US show of the summer tour. 'Gods Of War' and 'Don't Shoot Shotgun' remained in the setlist with 9 songs played from the 'Hysteria' album. 'Rock Of Ages' and 'Photograph' were played as the encore. The band managed to fit their own video screen on to the smaller stage and continued to use the 'other' drum riser. BTW Slash and his band actually played for one hour 7:30-8:30pm. See second setlist below. A Live Blog direct from the show happened on this site with help from Michele/Kerrin. The next show takes place tomorrow night in Canandaigua, NY - Last Live Blog of 2013!.